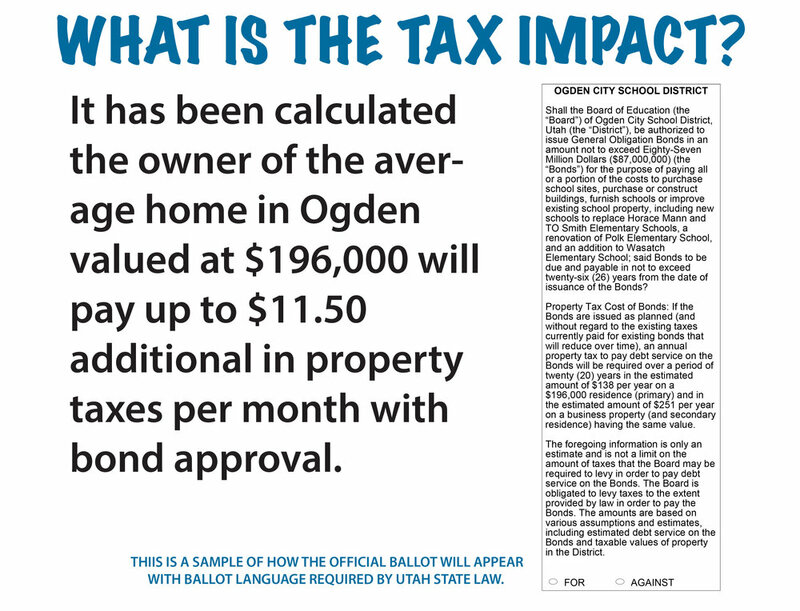 A series of open houses at schools in the Ogden School District are planned in October to allow voters to learn more about the Ogden school bond on the 2018 ballot. Interested voters are invited to stop by anytime during the posted hours to read information on the bond and for opportunities to ask questions and provide comments. “Shall the Board of Education (the “Board”) of Ogden City School District, Utah (the “District”), be authorized to issue General Obligation Bonds in an amount not to exceed Eighty-Seven Million Dollars ($87,000,000) (the “Bonds”) for the purpose of paying all or a portion of the costs to purchase school sites, purchase or construct buildings, furnish schools or improve existing school property, including new schools to replace Horace Mann and TO Smith Elementary Schools, a renovation of Polk Elementary School, and an addition to Wasatch Elementary School; said Bonds to be due and payable in not to exceed twenty-six (26) years from the date of issuance of the Bonds? Property Tax Cost of Bonds: If the Bonds are issued as planned (and without regard to the existing taxes currently paid for existing bonds that will reduce over time), an annual property tax to pay debt service on the Bonds will be required over a period of twenty (20) years in the estimated amount of $138 per year on a $196,000 residence (primary) and in the estimated amount of $251 per year on a business property (and secondary residence) having the same value. The Voter Information Pamphlet available in October will provide additional information regarding the 2018 school bond election. 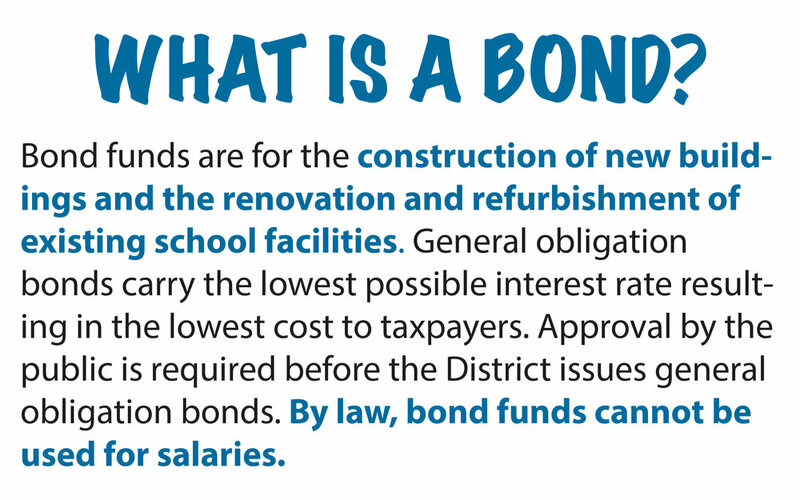 As part of the process of developing a bond proposal to present to voters, input from the community is sought regarding three possible bond scenarios. This scenarios are in draft form and are subject to change. The complete scenarios are available for review online at this link. Community stakeholders are invited to attend an open house Tuesday, August 7, from 6 p.m. to 8 p.m. at the Weber County Main Library to learn more about the scenarios and to provide input. An online survey is available at https://www.surveymonkey.com/r/bondscenarios for stakeholders to provide input regarding the three scenarios. Information gathered at the open house, through the survey, and via other methods of engagement will be used to inform the decision to propose a school bond on the November ballot. Tonight at the Ogden School District Board of Education Work Session three draft bond proposal scenarios were presented to the Ogden School Board for discussion. The scenarios were developed informed by input from stakeholders, professionals in the construction, architectural, and engineering fields, the District's capital facilities finance plan, and the facilities project tier list. Following discussion regarding the scenarios, the Board of Education approved moving forward to submit the scenarios for public input. The Board invites comments and feedback regarding the proposed bond scenarios from residents of Ogden City. The scenarios as presented are proposals for discussion and input only and are not final. The public is invited to attend the Bond Input Community Open House on August 7, 2018 from 6:00 p.m. - 8:00 p.m. at the Weber County Main Library to learn more about the proposed scenarios and to provide input to guide the adoption of the formal ballot question to be presented to Ogden voters in November. Additional opportunities will be made available online to provide feedback via survey regarding the bond scenarios. Further information will be posted to this website as it becomes available. Ogden stakeholders are encouraged to review the scenarios as presented to the Board of Education at https://drive.google.com/file/d/15TfAEp2LmIwf0DGk3S_OCnt-kGdTMQuR/view?usp=sharing. Additional information will be available at the open house on August 7th. On July 19, 2018 a presentation was made to the Ogden School Board of Education providing a summary of input gathered throughout the first phase of the school bond proposal development process. An overview of the communication channels utilized to communicate with school district stakeholders regarding the bond proposal process and how to be involved was provided. As part of the listening phase, stakeholders were invited to participate in structured engagement sessions to work together to identify the most urgent needs of Ogden students, while sharing what they value most, as related to school facilities. Feedback and input received from the engagement sessions was documented, including retaining artifacts from the process including notes, posters, worksheets, surveys, etc. This information was made available to the Board of Education in a written report. The presentation made to the Board of Education is available for download at https://drive.google.com/file/d/1qX-2getdPOy3cjref-Nq78lE634EHUfD/view?usp=sharing . A full PDF report of comments received and survey data is available at https://drive.google.com/file/d/1GemFhhqtSMD10Pjf2QLfTmWuLHok4x6P/view?usp=sharing Over 325 instances of written correspondence were received and are included in this report. It was proposed that informed by the recommendations made by stakeholders regarding urgent needs and values, the Ogden School District will develop and communicate a clear bond proposal plan to meet the most critical needs, while aligning with shared values whenever possible. Additional information regarding Phase Two: Action Planning will be made available on this website. Individuals interested in participating in engagement sessions are encouraged to provide contact information through the Get Involved form on this site. Additional opportunities for stakeholder input will be available throughout the process. The Ogden School District is currently in the process of developing a bond initiative related to school buildings and facilities to be presented to voters during the 2018 November general election. The first phase of this process is the Listening phase. The Ogden School District is asking stakeholders of the school district to engage in a structured way to identify the most urgent needs of Ogden students as related to school buildings and facilities. Stakeholders are those who have an interest in education in Ogden and who will be affected by the proposed bond. Opportunities to listen to stakeholders will come in many forms including working sessions, open houses, meetings, online responses, and direct dialogue. Stakeholders will be asked to not only identify urgent needs as related to physical school buildings, but to share what they value as related to school facilities. Throughout the Phase One of developing the bond proposal to be presented to Ogden voters in the general election, information and updates will be provided on this website. This website also provides an opportunity for stakeholders in the community to provide input and request further information and involvement through the Get Involved link. We encourage all those who have an interest in education in Ogden, Utah to educate themselves about the bond process and to engage in sharing related viewpoints.